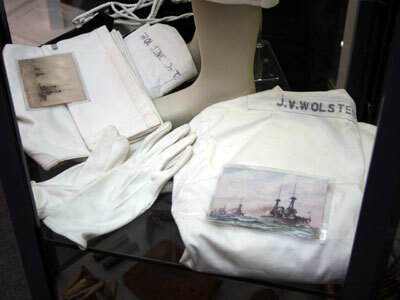 Joseph’s uniform is shown here – the mannequin is a bit small, but a modern adult-sized one would have been be too big! (The singlet – which is wrong in terms of uniform – was not Joseph’s). Joseph, a Manchester-born “piecer” in the cotton industry, joined the Royal Navy as an Ordinary Seaman in December 1915 aged 20. After training at HMS Vivid shore station, he served on the battleship HMS Neptune from 4th March to 30th September 1916. During that period Neptune was unsuccessfully attacked by a U-boat, and accidentally hit by another vessel. Neptune and, presumably, Joseph took part in the Battle of Jutland in May/June 1916, the largest naval action ever, and the last major fight between battleships in the Great War. Joseph’s uniform was found by Adam Hepburn of The Cannon, Newport Pagnell in a house clearance sale near Bedford.